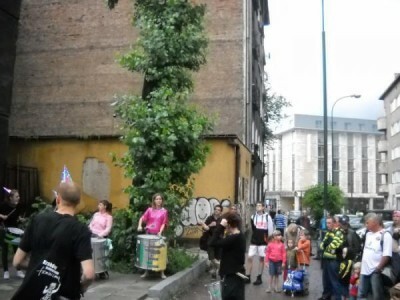 (12.07) At six o’clock in Krakow group of activists announced the opening of a new stand-alone on the street Worcella 8 The building is located at the retail park, arousing controversy for years now has a chance to become a space for grassroots socio – cultural. The event was accompanied by the Krakow Rhythms of Resistance, the hosts while so welcome newcomers cake and coffee, and more steadfast lived vegan kebab with barbecues. Picnic atmosphere unsuccessfully tried to stop the police, and as they refused refreshments, intervention can be considered doubly failed.